Eastern gray squirrel (Sciurus carolinensis), Madison, Wis., Oct. 27, 2017. This squirrel did not like me taking its picture. So I felt a little guilty taking this shot, even if I did love capturing how primly this particular squirrel folded its front paws. 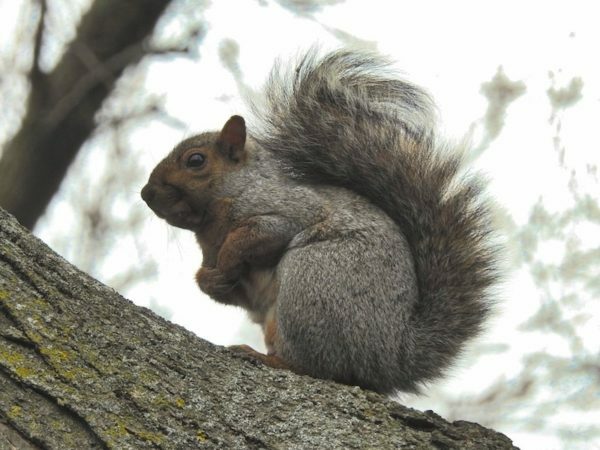 Why is it called an eastern gray squirrel? “Eastern” is because it’s found east of the Rockies; “gray” is for the white hair tips that give its coloring a grayish cast. And “squirrel” … Well, I think that part is obvious. One of the stories my mom used to like to tell about me took place right after we moved back to the United States (the first time for me, as far as actually being cognizant of where I was). We went to see giant redwoods in California with my aunt and cousins, but apparently I found the squirrels just as fascinating as I found the trees. Maybe it was because I’d already read about the trees in National Geographic World, but the squirrels came as a surprise. Squirrels exist in northern Europe, of course, but I don’t remember seeing any while I lived there. I spent most of my time in the cities, where the only rodents I became well acquainted with were mice. When we went camping, the novelty of sleeping in a tent was so delightful that i didn’t have any room left to think about looking for animals, apparently. The squirrels in California aren’t eastern gray squirrels. They have the western gray squirrel (Sciurus griseus), which looks a lot like its eastern cousin but is a different species. In Wisconsin, we have five different species of tree squirrels divided into three genuses. We also have ground squirrels: the thirteen-lined ground squirrel, which looks a bit like a chipmunk; and Franklin’s ground squirrel (here’s a Wisconsin-specific link), which looks more like a gray squirrel. Like this post? Read about other animals.